Cozy Mtn Home w/Hot Tub. Center of Keystone! New Kitchen! Free Shuttle Nearby! 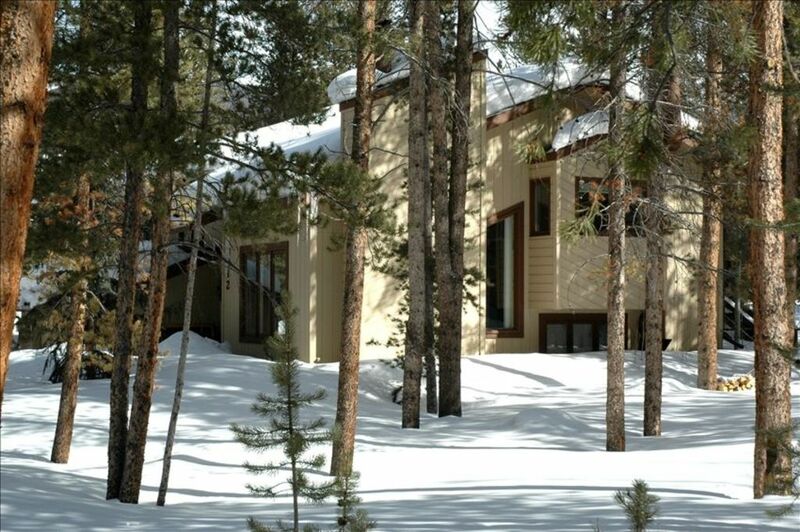 This beautifully decorated and well appointed home is located among the trees at the very center of the Keystone Ski and Golf Resort. Just off Soda Ridge Road on a quiet cul-de-sac, it is isolated from the hustle and bustle of this world famous resort, yet it is right in the middle all the amenities and activities Keystone has to offer. For easy access to all of Keystone's many fun things to do a rare free resort shuttle stop is only 2 blocks away. To top it all off, a private outdoor hot tub is provided for your relaxation and enjoyment! We have decorated our spacious home with a cozy mountain flair. The house over 2200 square feet of gracious living space with soaring cathedral ceilings and an airy multi-level design. With its flexible bedding configuration this home comfortably sleeps eight people in the four bedrooms plus more on the queen sleeper sofas. The perfect set-up for a wonderful family get-together. In addition to the four bedrooms there is a cozy living room with a wood burning fireplace (firewood provided), a dining room with doors opening onto the peaceful, shady deck (which has a gas grill, table, chairs and a private hot tub), a gorgeous newly updated and well equipped kitchen with new full-sized appliances, plenty of cabinets and lots of granite counter space, a family room with a wet bar complete with fridge, and a laundry room with a full-size washer and dryer. The lovely remodeled master bedroom suite has a king bed and an updated private bath with a shower. High vaulted ceilings in the living room, dining room and kitchen give this home a very light and spacious feel. The two car garage will protect your vehicles from the weather and also provide secure storage for your skis, snow boards and bikes. Firewood provided. Best of all this home is close to everything! Located in the center of Keystone on a forested lot only five minutes from Keystone’s main shopping and dining areas and the base at the Mountain House. Enjoy hiking and biking up the Keystone Gulch Rd., a national forest trail located 100 yards from the front door or walk to the shops, restaurants and activities in Keystone Village. To leave the resort just get on board the Summit Stage which offers FREE transportation to Breckenridge, Frisco, Silverthorne, Dillon, Copper Mountain and Arapaho Basin. Ski four resorts without ever having to get into your car! We take great pride in our vacation home and it is a joy to share it with others who will enjoy it to the fullest but treat it with the care it deserves. Our home is tastefully decorated with a professional flair and it is equipped with all the amenities you would expect in a cherished property. As frequent travelers ourselves, we understand what makes a vacation home a fun and comfortable place to stay; a place which will encourage you to return again and again. The furnishings are in excellent condition. The entire house is clean and well maintained with everything in good working order. Also, for your convenience, we employ a local management company to be responsive to anything in the house that may need attention during your stay. - Master - King-size bed, redecorated, and with a new private 3/4 bath. - Bedroom Two - Bunk beds equaling 2 twins. - Bedroom Three - Queen-size bed. - Bedroom Four - King-size bed. - Living room - Queen sleeper sofa. - 2 full baths (one newly remodeled). - 1 three-quarter bath with a shower in the master bedroom. In the center of Keystone Resort! Free shuttle nearby. (5) Four are flat screen TVs. 40 inch in living room and 32 inch in master bedroom. 5 TVs, 2 VCRs and 3 dvd players, total. Fantastic stay. Very comfortable for 3 families. Washer and dryer was great as well. We gave been renting for years. This house was definitely our favorite for our two families that go on a ski trip annually. The layout is great and allows for a kids entertainment area as well as an adult. Kitchen is a nice size and the honor closet is great if you forget something. Location works well and even though we went to Copper mountain the drive was reasonable. Highly recommend!